We’re delighted to present our Top Tea Tips, kindly sponsored by the Pennyhill Park Hotel & Spa. These have been compiled by Jing Tea Suppliers and Antonio D'Andrea the bar manager at the Pennyhill Park Hotel. Choose an appropriate tea - one that will not easily get bitter. Brew it double strength (twice as much leaf as normal but for just 3 minutes steeping). Allow the tea to cool slightly, and then pour 1 part tea over 1 part ice; garnish to taste. When choosing a tea you should select teas that will not easily get bitter with a double-strength brew. All types of tea: black, green, white, oolong, pu-erh and herbal infusions can taste great iced. The key to brewing a tea double strength is to use twice as much leaf, rather than steep the tea for twice the period. If you allow the tea to steep for too long, it could get bitter. If you pour hot tea over ice it will immediately melt the ice. It's best to have the tea cool to room temperature before pouring. You can refrigerate tea, but be careful with black teas. These can turn cloudy. 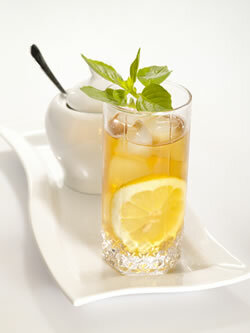 A few drops of lemon juice will help prevent clouding in black teas if you must refrigerate them. A slice of fresh fruit works well as a garnish, or you may wish to add honey or sugar. Our advice is always to taste the tea without additives. They generally taste great as they are. The quality of ice can affect the taste. Try to use good quality water when making ice for iced teas.